Spurred on by the bircher muesli I tried recently and a parcel of organic goodies from Suma, I finally got around to making overnight oats once again. I was particularly excited by this as I’ve been buying products from Suma for more years than I care to remember. They are a workers cooperative, sourcing and distributing a wide range of ethical and organic wholefood products. I am especially pleased as I am now part of the Suma Blogger Network. I wanted to keep my overnight oats simple, so mostly used the ingredients I received from Suma. Sprouted raw oats for easier digestibility, chia seeds for omega 3 and 6 (amongst a whole heap of other benefits), ginger for its paradoxical stimulating and soothing properties, raisins for sweetness and apples from my mother’s garden. Pumpkin seeds are meant to be good for thyroid health, so a few of those went in too. I used kefir as the soaking liquid, because we always have it on the go and it’s good for you. If you’re not sure what kefir is, you’ll find a bit more about it in my recipe for spiced kefir pancakes. However, you could use coconut milk, apple juice, a mixture of yoghurt and water or whatever else grabs your fancy instead. The important thing is that the oats have enough liquid to plump up and become creamy, both in texture and flavour. 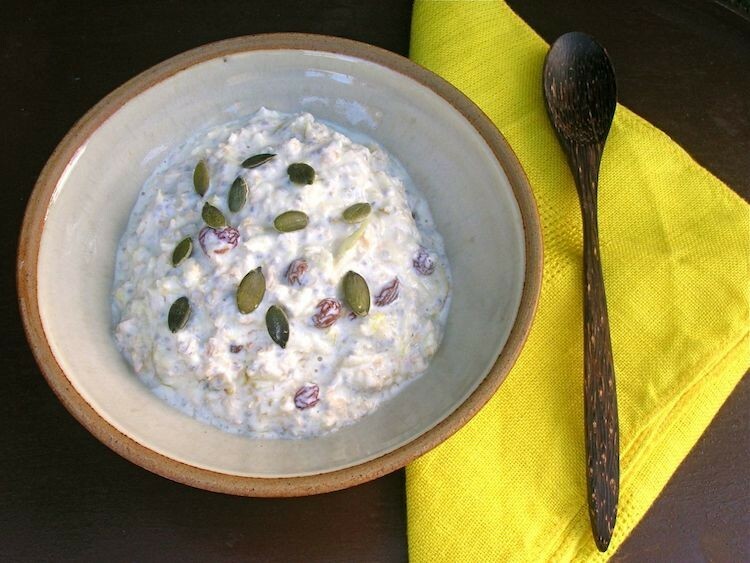 A creamy and filling healthy start to the day, with plump raisins and crunchy seeds. A little ginger provides a fiery kick and the apple some flavour. Place all of the ingredients, bar the apple, into a bowl and give a good stir. Cover and leave in a cool place to soak overnight. Quarter the apple and core. Grate the apple with skin on and stir into the oats just prior to eating. Kefir can be swapped for a mixture of yoghurt and water. Use any dried fruit instead of raisins and the ginger can easily be omitted or swapped for a more favoured spice. This overnight oats is my first recipe for the Suma Blogger’s Network. I’m also sending this to Credit Crunch Munch. We make our own kefir. Once you’ve acquired the initial grains, the only cost is the milk, so it’s a thrifty way of getting your probiotics. Hosted this month over at Elizabeth’s Kitchen Diary, it originally comes from Fuss Free Flavours and Fab Food 4 All. This is a perfect dish to kick start the day! Thanks Angie. Never quite sure why I don’t make it more often. Thanks Sus. Definitley feel I need something to kick those blues away – it’s so dark here. I’ve never made oats overnight before, I must try it! It’s even nicer with copious amounts of cream, as I first had it in Switzerland, but that doesn’t quite tick the health boxes. I’m a recent concert to the goodness of porridge and I’m now pretty much addicted to the stuff. Never heard of this overnight doohickey but I’m game! Dom, I’m open mouthed in amazement – you’ve always been so rude about porridge! What happened? I used to work in Switzerland and the bircher muesli used to be more creamy and calorific than any dessert – sinful stuff! But great! Thanks. It’s such a simple breakfast, but it does mean you have to think about it before going to bed. That’s a great looking breakfast, never thought of adding chia seeds to my muesli. Chia seeds work really well when soaked, but I can’t quite work out how to describe it without it sounding like gelatinous, or gloomy – so much better than those. Thanks Manu. I hadn’t made it in far too long, although it has to be said at this time of year I prefer porridge. I was one of the few children growing up eating porridge in the 70s in Italy. Back then very few people ever had porridge. My parents used to love wholemeal food including oats. That’s why I still love my porridge and I make it often for breakfast. Looove your recipe! Yay for Suma they are fab aren’t they! I just can’t get my head around overnight oats though…cold porridge to me is just like, well, porridge you forgot about and came back to when it was cold lol. I love the sound of the flavours in this and the extra benefits of the chia seeds but I really do think I’d want it warm! Think muesli rather than porridge Emma, that might help. Although I have to say at this time of year, my thoughts turn to porridge. Indeed, I’m eating a bowl of it right now. Delicious and healthy recipe, but can it be had with milk? Will definitely give a try! I’ve just dug out the porridge oats for the first time this winter just this morning but this sounds a far more exciting version that my bananas and honey I plonked on top! PS: Thank you for your comment; yep, I’ve been a bit quiet on the blogging front as we’ve had our hands full with our baby daughter! Hope you’re well? I love the new blog and look! Porridge is really what I want at this time of year, though it’s always nice to ring the changes. I’m not in the least bit surprised you’ve been a bit quiet online Kate – such lovely news. Oh yum! Will definetly make this for hubby, he is a bit sick and this will help him quite a bit. Oh no, I hope he makes a quick recovery Paola. There are plenty of good nutrients in this bowl of oats, so definitely recommended. Thanks Amy. It’s just lovely to have good ingredients to use. Those sprouted oats make the most fabulous porridge too. I have never made overnight oats its about time I need you have some great recipe ideas for them. 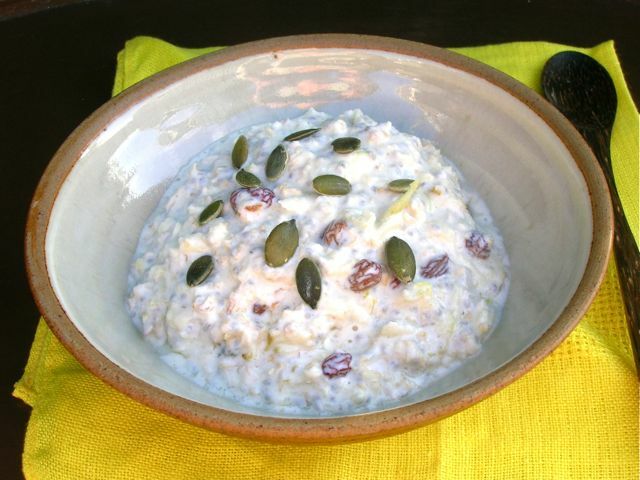 Oats are really delicious when soaked for a while Nayna – well worth doing.